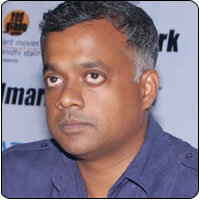 Gautham Menon seems to have struck a chord with Silambarasan during the making of Vinnaithaandi Varuvaayaa. With the film turning out to be a grand success, the director is already contemplating his next film. When asked by the reporters if there is a possibility to work with Silambarasan in future, the director’s reply was affirmative. He hinted that talks are already on with Silambarasan for their next film together. Gautham said an announcement would be made once things fall in place.